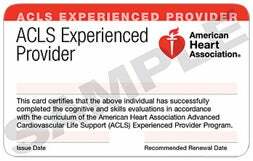 The American Heart Association’s ACLS for Experienced Provider Course is a dynamic program designed to challenge and expand the knowledge base of experienced providers. The goal of the ACLS EP Course is to improve outcomes in complex cardiovascular, respiratory and other (eg, metabolic, toxicologic) emergencies by expanding on core ACLS guidelines and encouraging critical thinking and decision making strategies. Through instruction and active participation in case-based scenarios, learners enhance their skills in the differential diagnosis and treatment of pre-arrest, arrest and post-arrest patients. Target Audience: MDs, PAs, RNs, NPs, Paramedics, etc… who are currently certified in ACLS, experienced in a critical care environment, and desire to expand their skills. The course is approximately 8 hours, and there is an online prerequisite that must be completed prior to the classroom session. The American Heart Association requires all students to have a current provider manual available to them “before, during and after” the certification program. In our experience, students that have the book prior to class, and take the online pre-course assessment are able to participate more fully in the class, and score better in the practical and written exams. Provider manuals are available for purchase with your online registration, can be purchased at our office, or are available the day of class.